The Green Market is in full swing down in Lincoln Park these days, so it was a pleasure to wander around trying to decide what I was going to make for Barbara's next Spice Is Right event over at Tigers & Strawberries. The theme for August, recognizing the abundance of locally grown fruits and vegetables, especially here in North America, is to use a locally grown spice, and then if possible make a meal with as many other locally grown products as possible. The irony here is that I found some absolutely beautiful serrano peppers yesterday that I bought to make some more salsa (local tomatoes, garlic and cilantro as well for that), but since I used that as my theme dish last month I wouldn't feel right using it again, and it wouldn't be any fun either. Which left me excited but stumped. I've so been enjoying my exploration of Indian-themed dishes that I wanted to continue in that direction. And as soon as Barbara announced the theme, I decided I wanted to find a way to use lamb in some kind of curry or spicy dish. 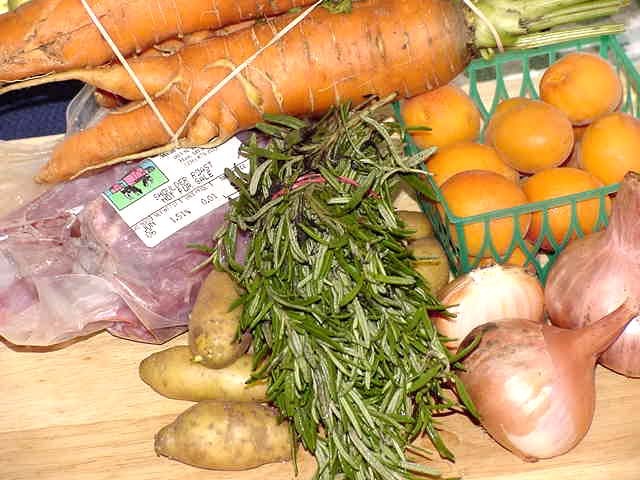 Every week I've been eyeing a stall run by Liberty Family Farm, LLC out of Hart, Michigan. That's the place that had the cool yarn Larry bought me for my birthday on my first trip of the season to the market. In addition to yarn, they have beef, lamb, poultry and eggs. Lamb is my favorite meat. Most of my friends know that if lamb is on the menu, that's what I'm going to order. So I thought this would be a good reason to splurge and finally buy some. I had the idea that I might make some kind of lamb curry, but I was hard pressed to come up with a locally-grown spice I could use for it. I also didn't have time to look up any recipes for ideas, so I had no real plan when I woke up yesterday and headed down to Lincoln Park. Luckily, they had a little lamb left. When I first decided to use lamb for this event, they had already sold out by the time I got there so I knew I had to get there earlier. They didn't really have anything that would work well for a curry, but I had my heart set on it, so I bought the last shoulder cut they had. I figured I could cut the meat off the bone, then make stock with the carcass. The one-and-a-half-pound cut yielded maybe three-fourths of a pound. That was fine, though, because I didn't want to make too much, and I wanted the focus to be on the vegetables, with the lamb being present, but not the main ingredient. The place right next to Liberty Family Farm had fresh herbs for sale. The minute I smelled the rosemary I knew I just had to buy it to use with the lamb. All thoughts of curry flew out the window, and I decided to make lamb stew instead. I found some beautiful enormous shallots and gigantic sweet carrots at another stand. I still had some garlic and fingerling potatoes I bought there last week, and maybe the parsley I got at the herb stand was still good as well. My stew was definitely shaping up. And then, as I was making my way out out of the market, I passed the fruit stand that has some glorious peaches and blueberries, where I had gotten the last of the cherries a few weeks ago. I stopped to check out the blueberries and noticed the blushing little golden gems sitting next to them. It was the last apricots of the season, and they were perfect. And they were the perfect last ingredient I needed for my stew. So of course they came home with me. I dredged the lamb in flour (non-local) and seared it in canola oil (also not local). The shallots, garlic, carrots and potatoes I added were all local. The roasted vegetable broth I then poured in was not, nor were the salt and pepper I seasoned it with, but the rosemary was. 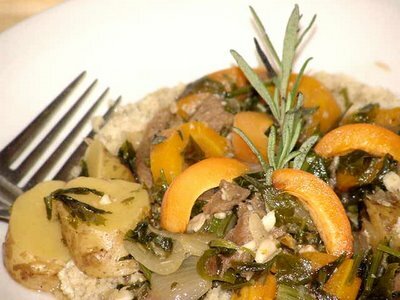 And the parsley and apricots I added in at the end came from the market. The whole wheat couscous I served it over were not local either, alas. But all in all, I was quite pleased with the result. Until I realized that, in all my excitement at putting together my semi-local lamb-apricot stew, I completely forget about finding and using a local spice in it. I got so excited with the rosemary that I forgot it was a herb, and not a spice, and I was so caught up in finding as much as I could at the green market that I forgot it was supposed to focus on the spice, and not just on the local. So the only spices in this dish are salt and pepper, neither of which are local. But my heart was in the right place, so I hope Barbara will still accept my entry. After I made this I realized it would have been delicious with pistachio nuts added to the couscous. Next time . . .
Add apricots and parsley and cook for another 10 minutes. Serve over whole wheat couscous, garnished with apricot slices and a spring of rosemary.